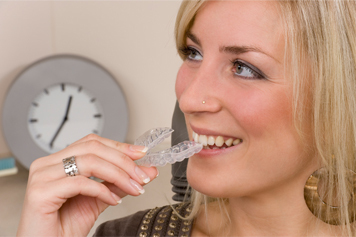 Invisalign is a method of orthodontic treatment by using a series of clear, removable teeth aligners that are used by dentists as the perfect alternative for traditional metal braces. The aligners are customized to fit your teeth perfectly and give you that confident and glowing smile. Unlike traditional metal braces, these aligners are hardly visible to the eye. You will witness no discomfort and would not have to shy away from smiling. The entire process of fitting these aligners is effortless and the wearer is free to eat or brush his teeth without any discomfort.